This post has like, zero politics, and is just discursive and recursive and indulgent ramblings, so feel free to skip. This wasn’t tonight, but that’s what it looked like! You set out on an eastward walk as darkness begins to stretch a light blanket over the sky and crickets warm up their chittering symphony. You’d say it is still light out when you leave the door, but by the time you’re a few blocks away from the lake, where the air takes on a subtle sweetwater perspiration, cars have their lights on and faces are indistinct until they pass you, barely preceded by snatches of conversation. You don’t know the signs or the rule, and you can’t help them with their space issues. The conversations are all couples right now, older than you, settled in, comfortable in the minutia of their observations. Relaxed and unhurried as they disappear into the strengthening night. But you’re unsettled. It’s one of those slightly cool August nights, free from humidity, with a hint of smoke in the air, with a hint of fall, even as the beach and the shorts and the high schoolers laughing and playing without the hint of school remind you that it is still summer, dominating its tanned and endless kingdom. But you know it isn’t endless. These are the nights that leave you with a vague sense of disquiet in your stomach, a wordless anxiety. You know that for them summer’s endless kingdom is a fraught promise, a castle built on sand. You know that all this ends. You pass a pack as you walk, a group of boys and girls unfurling in a coltish and happy tangle of legs and exclamations. You learn that Anika is going on a trip, and her pack of friends separates as they part ways, with her walking off alone, to some family vacation or end-of-summer space camp or something that will put a little distance between her and the group, because she’ll change, and they’ll have their memories of these last few weeks, so vital and important and fraught with meaning, and while they’ll all be friends and laugh when school starts again, she’s leaving in a way, each footfall on the other track another step toward a different life. You hear a gasp and feel a general turning toward the vast dark lake, from which you had looked away for a few minutes. 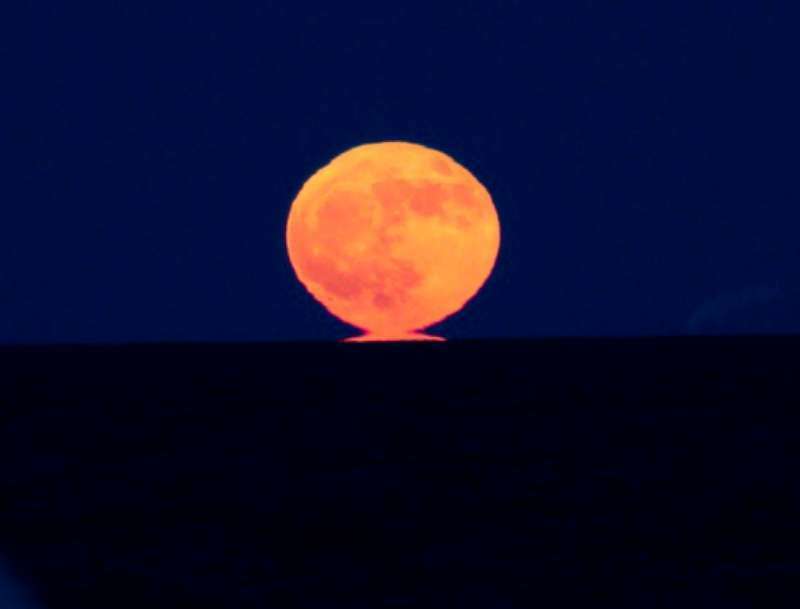 You see a tiny sliver of orange start to poke its head over the distant horizon, somewhere from in the black water or the Michigan shore or maybe space, but probably not, because it quickly becomes close enough to grab. The moon rises with blink-fast rapidity, pulling itself armlessly and elegantly out of the water, its movement imperceptible but steady. It is half, and now three-quarters out, and suddenly it is a bright and huge orange in the sky, the shadows of its mountains like scars on the face of a clown, casting a strange and almost nauseous reflection on the water below. It’s a waning moon, though. Its fullness is evaporating, a gibbous detumescence anticipating the humpbacked deformity to come. But only barely. It is still powerful in the sky, barely a sliver removed. You’d have to stare to know that its glory is passing. But it is. The lake does it no favors. It is a quiet beast today, lapping contentedly on the shore, the quiet a mere memory of its fury, its consistency reminding you of its permanence and possibility. The moon may control her tides, but it can’t control her depths. The lake is there regardless of the how much shimmering reflection the moon grants it. It starts to disappear in and out of clouds, and you walk on, near the walking path that marks the eastern end of the campus. It isn’t packed, but there are students here, and you have the impression they are here early for orientation or maybe late summer classes. There is a newness to their interactions. They have ignored the moon by now, but what the hell? So have you. You let the night sift their conversations as you pass, as they stammer toward friendships, toward grasping and unclasping, toward experience. These are all conversations you’ve had, to an extent (ok, maybe not the Korean one). That halting attempt to say something interesting, not sure if you are being a boor. That stammering, no big deal if you guys don’t want to but we should hang out or walk together, but no big deal attempt at being cool while desperately wanting a few more minutes to figure out if this is your life or if it is just a moment. The small trials of unfolding into adulthood. You feel like an infiltrator, like your age is an invader, a parasite, that it can infect them. You don’t belong to this world of summer, this newness of experience, and that’s why the nostalgic autumnal insistence is unsettling. Because you know that endless possibilities constrict. You are happy in adulthood, find a grace in the autumn, have peace with its minor disappointments. But the lake and the last summer days aren’t yours. There shouldn’t be peace. There should be rage, and deathlessness. There should be exploration. There should always be that first electric, butterflied touch of grazing fingers, of captured stares, of halted conversations, of trying out new phrases, new identities, new vocabularies, of deciding to be Korean, of grass stains that come from stretching your new-limbed body on suddenly unfamiliar ground, of thinking that the lake beats itself against the rock for you, and only you, on this moment. And you no longer have that. You can’t, and you shouldn’t. It is a different kingdom. And so you walk on. The moon continues to rise, shedding its orangeness like childhood skin, growing austere and aloof in its whiteness, breaking up in the new glass buildings of the old campus. It rises imperious, but is still gibbous. It still has that terrible secret. Its liquid reflection a potent of shimmering deliquescence. You walk back, away from the lake, toward the noise of bigger streets and gas stations. You have to stop at the store, where loud country songs and fluorescent announcements pounce on your quietude. You are still grumbling as you cross the huge and empty parking lot, the setback, the blight of urbanity, when, toward the darkened exit, a gray fox jumps across your path. You turn onto the sidewalk, and he’s there a few feet in front of you, before bounding across the street. But he turns and looks at you. You lock eyes for 5, 10, 15 seconds. You pull out your phone, and regret taking a fuzzy, unnatural-flashed picture, which can’t capture the moment you ripped yourself out of. He stares for another second, and then with the mildest hint of disgust, breaks your contact, and bounds off. That’s the point, though. No matter where you are, you’re just a tiny part of this vast and unconcerned planet. But that means you, and everyone else, the families looking at the moon, the strollers discussing the room they have, the ice cream stores with sticky summer families, the teens parting and the ones joining with stammering newness, the nattering crickets and the embarrassing frogs, are part of something beautiful. You’re part of this beauty. You’re all waxing. You’re all rising. This entry was posted in Chicago, Great Lakes, Nonsense, Self-promotion. Bookmark the permalink. Nonsense or not, I loved this. A perfect read for this kind of night (which I missed out on due repairing a freezer that stopped freezing, so I appreciate vicariously walking through yours). Thanks Brian. Thanks Billy! That’s really nice of you to say. That’s always terrible when the prosaic interferes with the sublime, unless of course that prosaic is, like, really good TV. Then the outdoors can go pound sand. It was awe inspiring. beautiful to the point of perfect. our closest and dearest reminder that we all are, as Carl Segan said, “Starstuff”. If more people, no,actually all people, adopted that point of view we would all benefit. Great piece. The fox drives home the point somehow.